9 tables full on Thursday afternoon! The Origins Game Fair is less than three weeks away! We’re gearing up for some fabulous gaming. 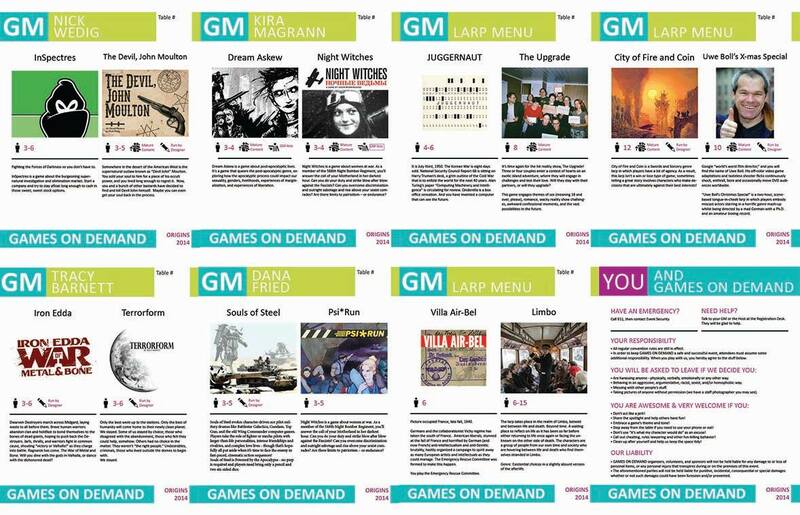 Games on Demand at Origins this year will feature new small press games, experimental games run by the designers who created them, LongCon games that run multiple sessions, and freeform Larps on Demand! We’re looking forward to gaming with you. Stop by with a few generics, and we’ll guide you to an excellent time. Dungeon World, Fate Core, Apocalypse World, Swords without Master, Feng Shui 2, Fiasco, InSpectres, Iron Edda, Monsterhearts, Night Witches, Nobilis, The Fifth World, Urban Shadows, Ars Magica, Atomic Robo RPG, Burning Wheel, Clash, Cthulhu Dark, Demons at the Door, Bob’s Brain, Dogs in the Vineyard, Dream Askew, Dresden Files RPG, Durance, Edge of Empire, Fate: Dragonriders!, Gamma World, Geasa, Golden Sky Stories, Heroine, Hexes and Eights, How To Be Human, Itras By, John Moulton, Kingdom, Montsegur 1244, Mouse Guard, Mutanthearts, Night’s Black Agents, Odyssey, Project: Dark, Psi*Run, Silent Night, Souls of Steel, Spark, Tabletop Blockbuster, Terrorform, The Warren, TimeWatch, Torchbearer, Trail of Cthulhu, World Wide Wrestling, Wrath of the Autarch, and more! Origins Game Fair in Columbus OhioÂ (happening June 11-15th) is our favorite game convention of the year. Why? It’s super laid back and fun, and you actually get to hang out with people, eat delicious Columbus food and drink delicious Columbus drinks, and play all of your favorite indie games with all my favorite indie people without running around like mad like at a gigantic convention like Gencon. Evan Torner, Jim Crocker, and Kira Magrann are organizing Indie Games on Demand again this year! If you run four games you can get a free badge! Check out the Origins website, and Indie Games on Demand site on Facebook! One of our goals is toÂ even furtherÂ diversify our GM team this year, and if you identify as a woman, POC, or are LGBTQ, we would love it if you would consider helping us out! Alternately, if you can’t make it, please help us spread the word by sharing this post on your social media, and asking friends you might know are going to check us out. Is here! 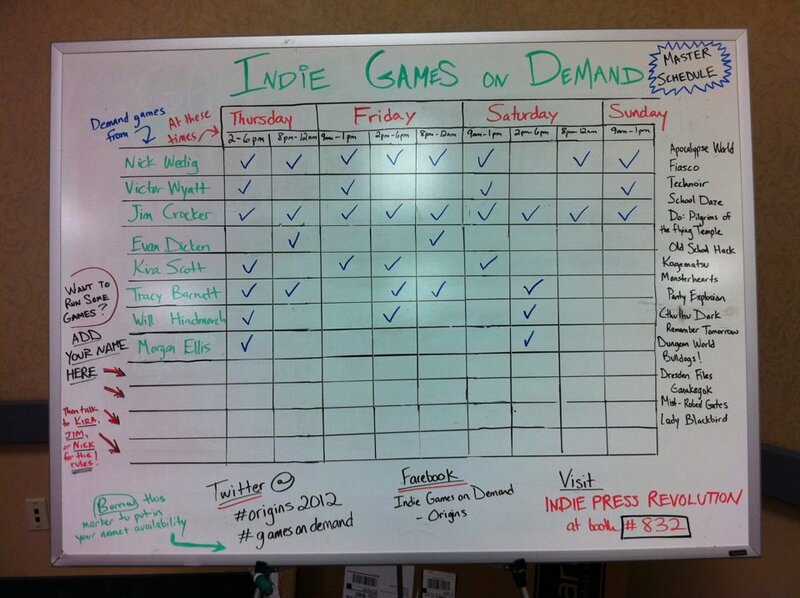 This is a list, although not exhaustive, of games we’ll be featuring at Indie Games on Demand at Origins. Take a look see! Most certainly there’s games not on this list that our GMs would be interested in running. If you’re curious about something you’ve heard of but it’s not on this list, just ask. Also, not all GMs can run all games. Although that would be an amazing feat, we are limited by the games we enjoy and know how to run. Games on Demand for #Origins 2013 is building up steam. three sessions a day Thursday through Saturday, with a bonus on Sunday morning in case you didn’t get enough. You can find listings for the event in the Master Event Grid and everything! We’re starting to get excited about Origins! We’ve got an A list of GMs ready to run all of the games, at your demand. We’re up on the Master Event Grid as Indie Games on Demand, and pre-registration for games should be up any day now on the Origins site. The event will take place in the Hyatt-Fairfield room and will run in three sessions each day, from 9am-1pm, 2pm-6pm, and 8pm-midnight on Thursday through Saturday and 9am-1pm on Sunday. For more information, join our Facebook group to meet the community of GMs and players: Indie Games on Demand â€“ Origins. This year we’ve got pretty banners, new game menus to easily find new exciting games, nanogames, new playtests, Marvel Heroic and Monsterhearts which are both up for Origins Awards, and an exciting Jeepform larp schedule running in addition to the main event. Also, keep your eyes peeled for a PDF game menu to appear on this site. We’re making your demanding even more accessible! The Master Schedule is up at Origins! The Indie Games on Demand room is all set up and ready to run games tomorrow at 2pm. Stop by and visit us! 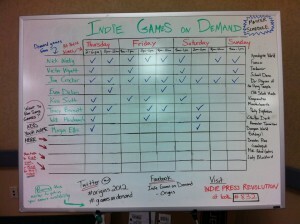 Indie Games On Demand at Origins 2012! Hey! You! Gamers! Are you coming to Origins Game Fair in Columbus, Ohio this year? The convention runs May 30-June 3, 2012 at the Greater Columbus Convention Center located right downtown. We would love to see your game faces at our Indie Games on Demand event! Last year we hosted a room full of small press games and the gamers who love them. There’s still plenty of time to be a part of the event this year, if you’re interested in playing games or running them.